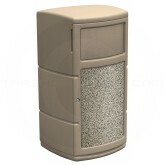 The Locking Side Entry waste container includes several options to fit in a variety of retail, business, or public environment. 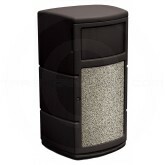 You can customize this unit by adding your own graphic with advertisements, logos, or a message for your customers. Two large flipper doors on either side contain odors and keep insects out. Standard Inclusions: (1) removable serving tray holder, (1) riverstone graphic (1) liner with molded-in handles (2) keys (2) clear graphic covers.